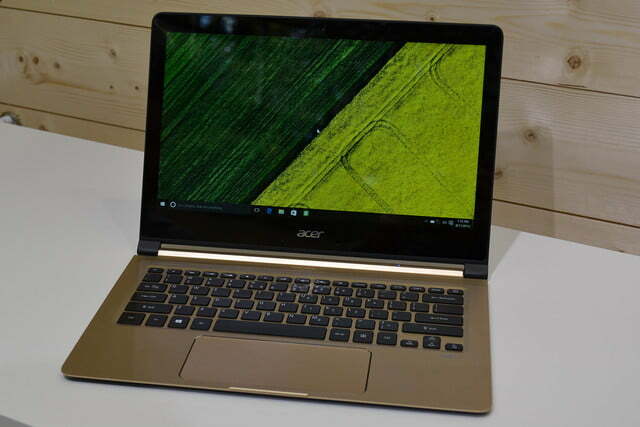 Earlier this year, Acer debuted the Aspire S 13, an impressive mid-range notebook that combined thin design with a fast processor at a very low, $750 price point. 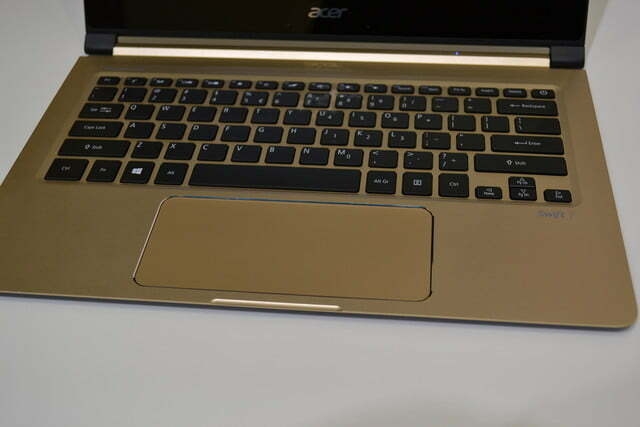 But the Aspire S 13 was perhaps a bit too affordable, and as a result it felt a bit flimsy. 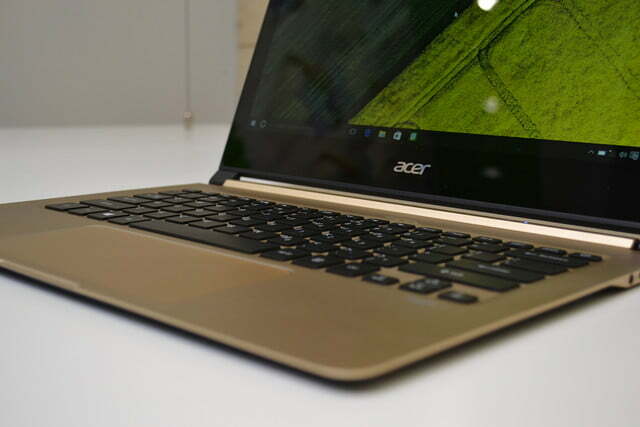 Now, Acer has introduced the Swift 7, a slightly more expensive laptop that seems to rectify the Aspire S 13’s mistakes. The first thing you’ll notice is, of course, the gold paint job. 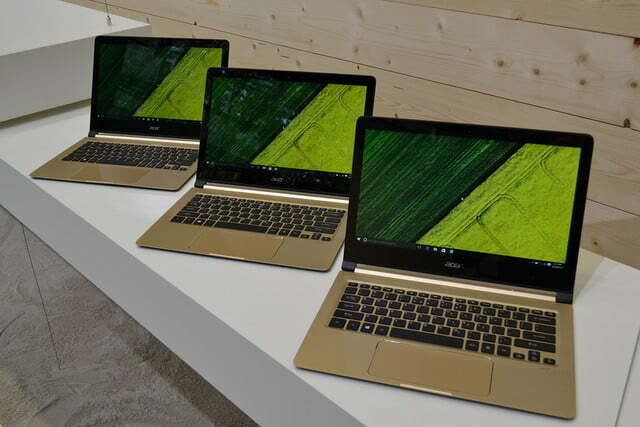 A lot of PC manufacturers have tried gold since Apple turned it from gaudy to chic with the iPhone and MacBook. 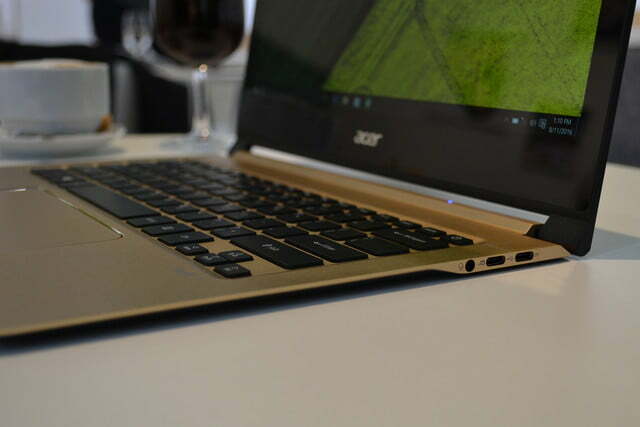 Most don’t quite get it right, but we like Acer’s take. It’s opted for a bold, ultra-metallic gold that makes no attempt at subtlety. This helps it stand out from the MacBook and from Dell’s XPS 13, both of which go for a more reserved, semi-gloss look. 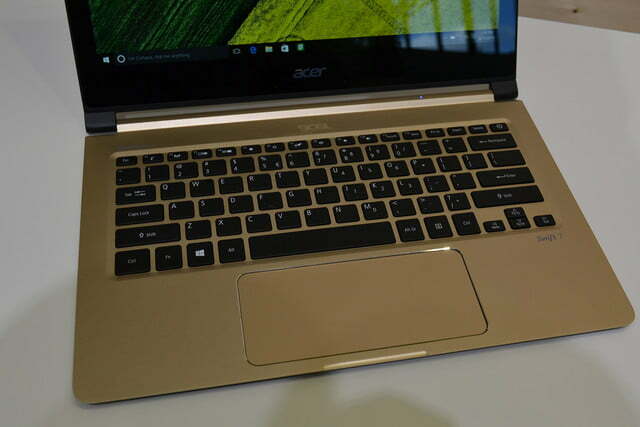 Acer’s gold metallic flake makes no attempt at subtlety. 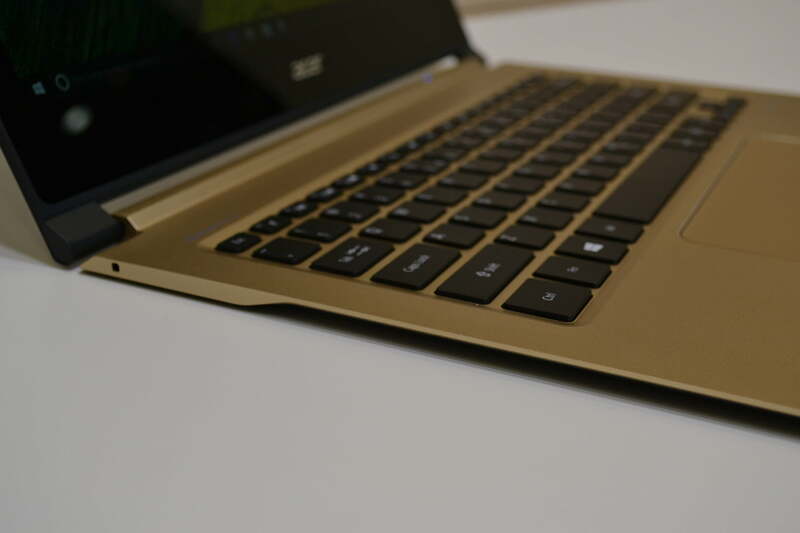 Like its sibling, the Acer Spin 7 2-in-1, the Swift 7 has a 13-inch display. But it’s not just a Spin with the convertible 2-in-1 hinge removed. It ditches the touchscreen, aggressively bevels the edges, and drops a few grams. That helps the laptop come in just under 10 millimeters thick, and it weighs only 2.4 pounds. We’ve seen lighter notebooks, like the LG gram 14, but most systems that go on a diet this severe end up feeling weak. The Swift 7, fortunately, seems sturdy and looks great. 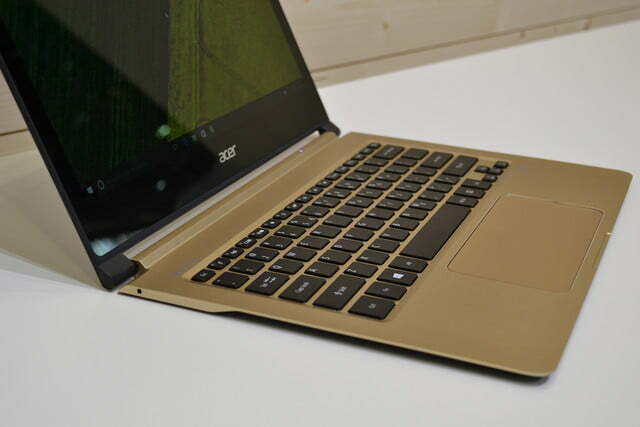 It’s not the most attractive laptop we’ve ever laid eyes on, but it’s much better than the Aspire S13, and on par with Asus’ Zenbook line-up. 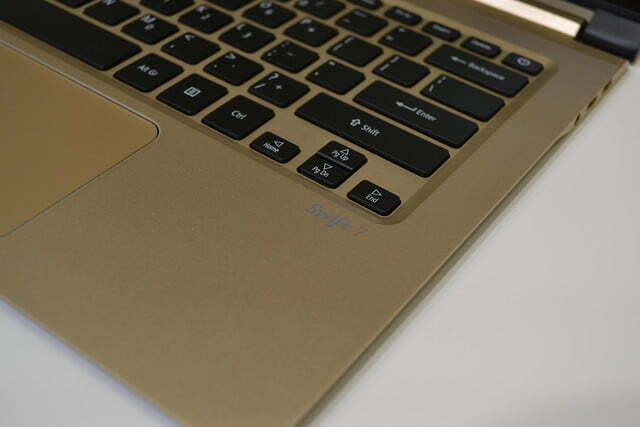 We can’t say the same for the keyboard, which is extremely similar to that on the Spin 7. We don’t mind it, but it’s not nearly as impressive. 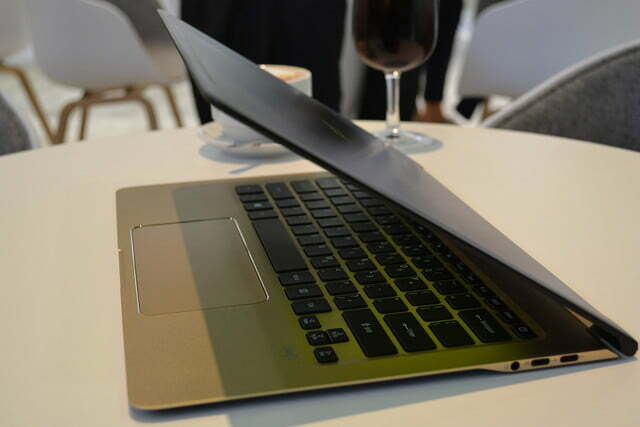 That hurts the Swift 7, because it’s a dedicated laptop, not a 2-in-1 device like the Spin. You’re going to be using the keyboard all the time. Luckily, the keyboard is somewhat excused by the touchpad. Its ultrawide design is much larger than is typical, providing extra room to wag your fingers. HP used a similar design in a few past laptops, but it didn’t last. 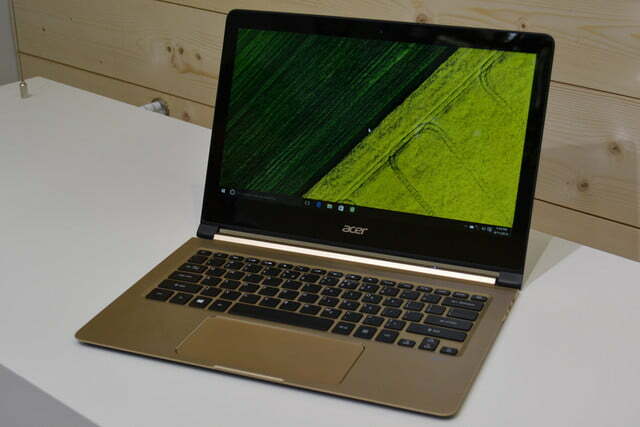 We’re glad Acer has given it a second chance. The extra space is great for using touch gestures, something you’re likely to do here, because a touchscreen is not an option. Inside, the Swift 7 has an Intel Core i5 processor paired with 8GB of RAM and a 256GB hard drive. 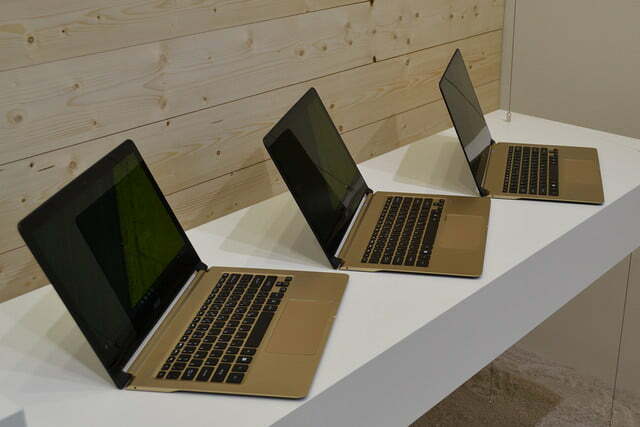 These features are typical for a laptop in its price range. They won’t win it any awards, but they also don’t put it behind the curve. Battery life is quoted at 9 hours. That sounds great, but manufacturer claims of endurance can be unreliable, so don’t count on it until you read our review. 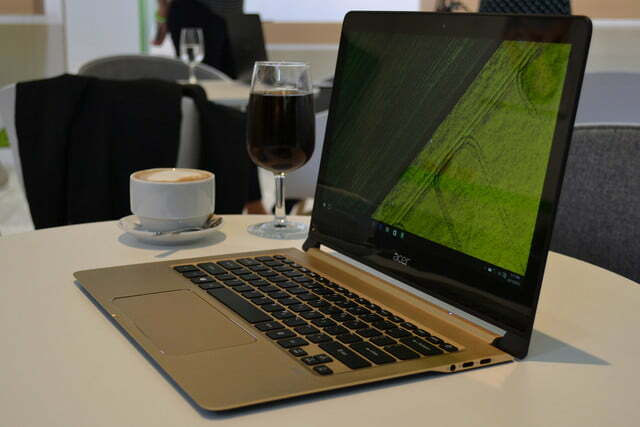 Connectivity is where this laptop is way ahead of the curve, for better and for worse. It offers two USB Type-C ports, and headphone jack, and that’s it. It at least offers two ports, but still – most users are going to need adapters, and that can swiftly turn into a tangled mess. It also adds to the final price. Thankfully, the base MSRP is only $1,000. That’s on par, or a bit less, than many of the Swift 7’s competitors. 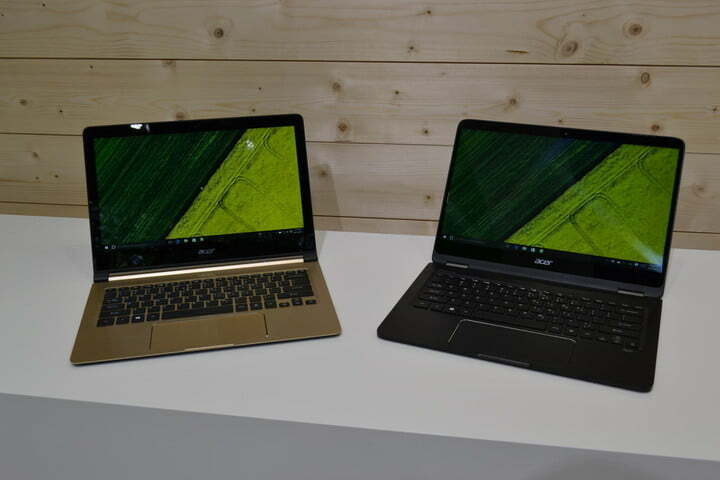 We don’t think the Swift 7 is going to unseat Dell’s XPS 13, the reigning champion of 13-inch notebooks. 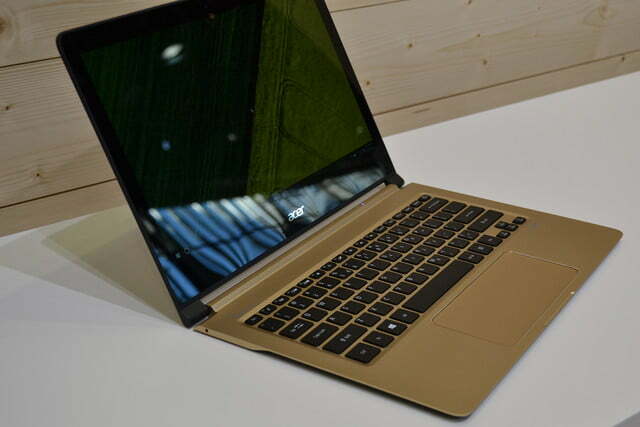 It’s also facing tough competition in the form of Asus’ excellent Zenbook. 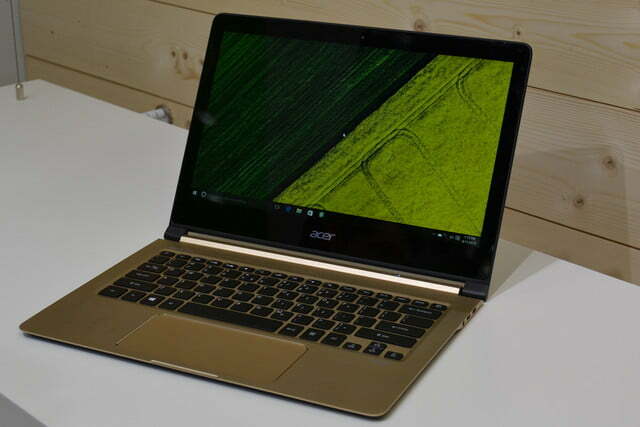 But it’s a great addition to Acer’s line, and may end up being the best 13-inch notebook the company has built in years.